Portraits have been part of photography’s dialogue from the medium’s inception to the contemporary idiom of selfies. In response to this conversation, the gallery L. Parker Stephenson Photographs, in New York, present an exhibition of portraiture tracing the kaleidoscopic range of the genre’s artistic, commercial and documentary forms. In work spanning from the 1920s to the present day, artists on view respond to the visual cultures of their times with images meant to experiment with vision and communication and to address social realities. 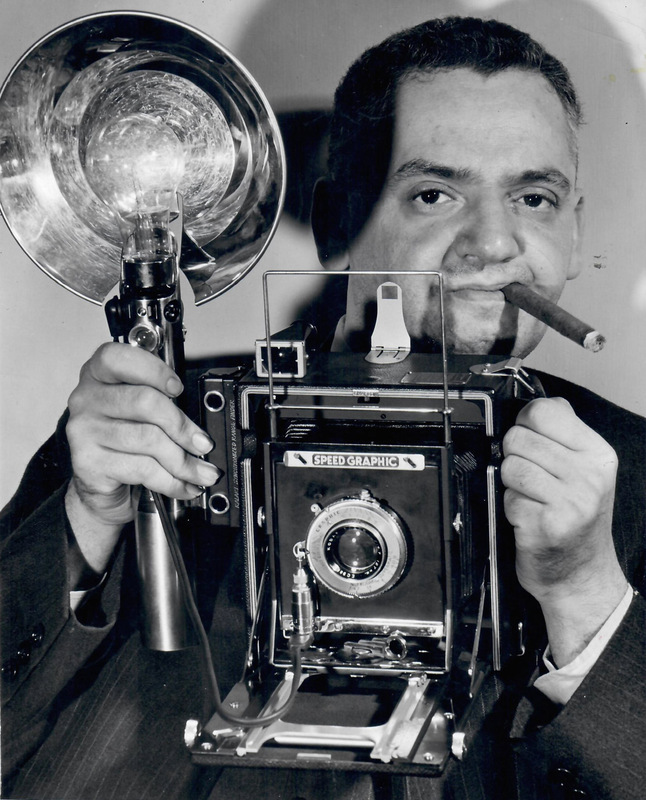 The unique position of the photograph in media, as something both mechanical and expressive, is presented with salty humor in Weegee’s Weegee with “His Speed Graphic”, wherein he stages himself in the persona of “A Photographer”. Vanguard art in the 1920s embraced the mask-as-self as a portal to psychological or societal understanding as seen in Charlotte Rudolph’s study of dancer/choreographer Mary Wigman, as well as in works by Ogawa Gesshū, Osama Shiihara, and Umbo. The same sense of construction informs celebrity portraiture, found in Burt Glinn’s Katharine Hepburn, England. Works by John Cohen, Emmet Gowin and Shoji Ueda embody intimate observations and experiences, using the camera in a private sphere of family and friends. In the case of Cohen, the later fame of his subjects is incidental. Art dealer Richard Bellamy and painter Alice Neel acting in Pull My Daisy made by Cohen’s neighbor Robert Frank were simply performers in an “indie” film. On one another side, the photographs of Jan Yoors synthesize his artistic independence and his status as an immigrant with deep engagement in self-contained communities. In his images from Harlem he considers place through human presence. Social documentarians Roswell Angier and Sirkka-Liisa Konttinen utilize photography along with writing, expanding their tools of exploration. Angier’s prints of Native American communities in New Mexico contain more writing than image: his self-consciousness of power dynamics between photographer and subject informs and shapes this process. An example from Konttinen’s lifelong focus on the working-class culture of Newcastle is taken from her book Step by Step, where mothers and daughters involved with local dance schools offer a multi-generational voice to this exclusively female sphere. Kikuji Kawada’s Special Attack Forces Photograph, part of his book Chizu/The Map, touches on the physical remains of the historical past in Japan in the aftermath of World War II. Kawada’s philosophical contemplation of violent world history is distilled through ephemeral personal effects. Retrospective traces of upheaval can also be seen in “Bill Burke’s Man” with a “Rubber Foot, Phnom Penh”, from Cambodia following the reign of the Khmer Rouge. The photographic portrait can present people as individuals and also as generic types. The contemporary ones by Jacques Sonck confront this polarity by eliminating all information about the identity of sitters, yet each is fantastically unique in his or her physicality. The archival impulse drives J. D. ‘Okhai Ojeikere’s extensive recordings of women’s hairstyles in Nigeria, generating an historical project that also asserts a sense of post-colonial independence and identity. Running a commercial studio in Bamako, Mali, Malick Sidibé’s ebullient images are a vigorous reinvention of the hallmarks of photographic modernity: a sense of selfdirected presence and style in a new world. Reflective of the euphoria of political autonomy and nationhood, the portraits of Ojeikere and Sidibé embrace their immediate moment with a view to a future of possibilities.